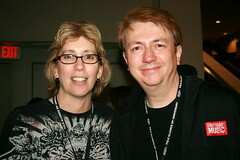 Had a great time attending the Folk Alliance conference in Memphis a couple weeks ago. Here are the pictures to prove it. Ran into the lovely Dalis Allen, who produces the 18-day folk music extravaganza known as the Kerrville Folk Festival in Texas. Photo by Pooki. 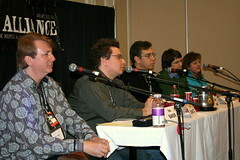 Had an interesting time doing the "Internet Is Your Friend" panel with Jim Schultz of Sonicbids; Madlyn Sklar of GoGirlsMusic.com; Martin Folkman of Musicians Atlas; Michelle Conceison of Market Monkeys, and Lydia Hutchinson of Performing Songwriter magazine. Photo by Pooki. Not even out of her teens yet, Sierra Noble is an amazing fiddle player from Manitoba Canada who has accomplished some impressive things. See for yourself at www.sierranoble.ca. Photo by Pooki. 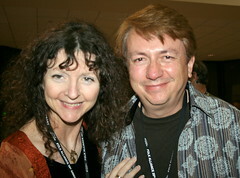 It was great to run into my Nashville-based friend Kari Estrin at Folk Alliance. 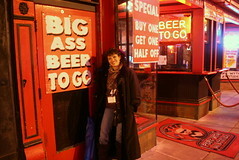 She specializes in managing Americana and folk music acts, as well as acoustic radio promotion. Visit her at www.KariEstrin.com. Photo by Pooki. 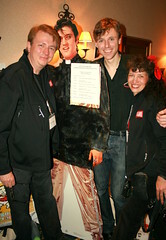 What a thrill for Pooki and me to meet Joel Plaskett, an award-winning rocker from Nova Scotia. We'd seen him play live before and even covered one of his songs at gigs in St. Louis. But we'd never met him until Folk Alliance. Thanks to Kari Estrin for taking the great photo with the King! 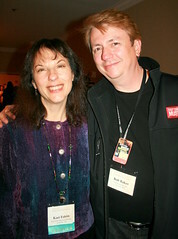 Ms. GoGirls herself, Madalyn Sklar, with yours truly in the exhibit hall during the conference. Photo by Pooki. 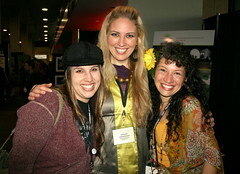 (l-r) Singer-songwriters Jenn Franklin and Annelise Le Cheminant (my Nashville/Salt Lake City friend who wowed us with her solo showcase slot) strike a pose with Pooki at Folk Alliance. 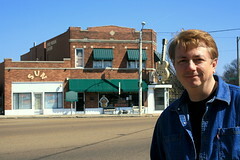 Standing across the street from Sun Studio in Memphis, TN. The place where Sam Phillips, Elvis Presley, Carl Perkins, Roy Orbison, and Johnny Cash launched a new brand of music in the 1950s. Photo by Pooki. 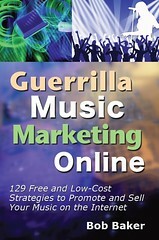 Derek Sivers, president of CD Baby, calls it "The most directly applicable, start-tomorrow, creatively inspiring book I've ever seen on promoting your music!" Get more details here.